Home / Agents of SHIELD / Marvel / Reviews / TV / [Review] - Agents of SHIELD, Season 1 Episodes 15, "Yes Men"
[Review] - Agents of SHIELD, Season 1 Episodes 15, "Yes Men"
Let's all just admit to ourselves that Agents of SHIELD won't be getting a second season, yes? The inconsistent quality of the series thus far (or rather, the consistent low quality) doesn't really warrant another chance. And at this point it's very obvious that ABC has lost interest in the series. This week, instead of a new episode, it aired what amounted to a clip show for the MCU films, something which the television network has no stake in whatsoever, but which they decided was a better use of the hour than airing a new episode of their actual original series. And all of that is sad, because occasionally SHIELD has an episode that shows us what the show could have been; namely good. Yes Men was mostly such an episode. It was, at the very least, what the series should have been since much earlier on in the run. And I don't mean filled with guest stars from the films (though that helps). I mean it had purpose, was engaging, and felt like part of the universe it has been meant to be expanding, rather than just sort of hanging off the side of the beast like a vestigial limb. Preempting a fresh episode in favour of a cinematic back-slapping session really undermined the level by which Marvel itself considers SHIELD part of the MCU. Hit the jump for the review, which contains spoilers (for this episode, and The Dark World) that don't want Thor to know they are alive. This should have been the Thor 2 tie-in episode. It's just that simple. As much as I enjoyed the berserker episode, it was a story that could have been told by the series at any time. And considering how completely the writers haven't followed up on the emotional repercussions of using the staff on either Ward or May, that episode hasn't contributed anything to the series, or the MCU. This episode did. Sif's presence was a welcome one, for a number of reasons. 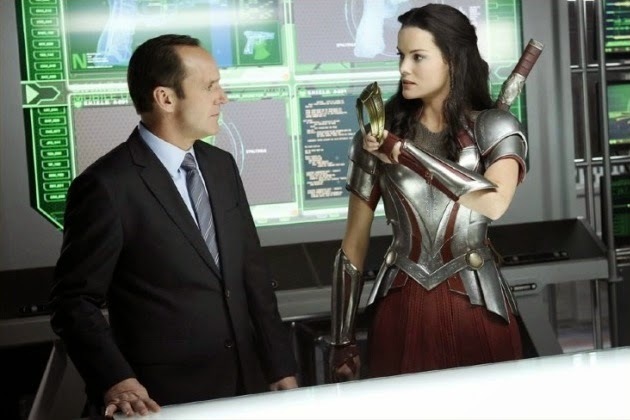 One, Jamie Alexander deserves every opportunity to play Sif, because she's wonderful in the role and is clearly enjoying the hell out of herself (and this episode bumps her up into the limited echelon of MCU characters to have made crossover appearances, something that not even Rhodey has managed). Second, it really drove home the fact that Coulson's team doesn't exist in a vacuum. They are actually part of the larger picture, something that no number of references to Tony Stark or gamma rays have managed to do to this point. Third, because Sif and Coulson have worked together before, they can jump straight into trusting each other and working together, rather than having to suss each other out. Which, in turn, means the episode can move that much faster, and makes room for more character stuff. That's not to say the writers made use of the opportunity, but it was there. Sif also managed to fill in some of the gaps lefts open after Thor's most recent outing. While the ending of the film (my interpretation, anyway) suggested that Thor had left Asgard behind and was now Earth bound permanently, Sif seemed to suggest that she's been in contact with him since the film's ending (which makes sense, considering Heimdall's vision, and the rebuilt bifrost). She also specifically mentioned that Odin had sent her after Lorelei, and as we know, Odin is really Loki. While I have no expectation of ever seeing Lorelei in Thor 3, it does suggest that Loki is working towards something, which will hopefully manifest as an appearance by The Enchantress in the eventual threequel. But most importantly, with Coulson still desperate for information about the blue tube dude that gave him and Skye their mojo back, he inquires about all the aliens Sif has encountered (which, thanks to the post credits scene, we know she has done). She reams off a list of them, surely as much literal universe building for Guardians of the Galaxy as future MCU projects. And the Kree were smack dab in the middle (for a break down of everyone she mentioned, check out this article). This is information that Coulson's team couldn't have discovered without her involvement, so credit to the writers for recognizing the opportunity, and creating some synergy with their bigger budget brothers. It manages to further both the SHIELD storyline, and the larger universe, which is what priority one for the series should have been from day one. The episode's parts were greater than it's sum, which has been pretty much par for the course on this series. Sif was wonderful, and Lorelei was an effective villain (though the actress clearly wasn't given any weapons training for her sword battle). Coulson's character was motivated, and is always more enjoyable when he's being a smartass doing his job rather than when he's being all serious and borderline weepy. But the actual plot was standard issue. How many times have shows done brainwashing episodes? How many times have the strong male lead been coerced into turning against his team? There were chances to do clever things here, like have Ward being immune to Lorelei's effects, and working with her only to turn on her. Or have one of the women be susceptible to Lorelai, thus offering a glimmer that this incredibly white cast might have some sexual diversity to it. Sadly, the writing ever only falls back on convention. It's as if they're under instructions to purposefully not be imaginative or original in episode construction. And that is getting tiresome.